My Guiltiest Pleasures | Eat It, St. Louis! A taste of Fall only found in St. Louis and surrounding areas are Merb’s Bionic apples. Only six bucks and 600 calories for a meal sized apple dipped in thick carmel and rolled in pecan. Each year I lament that I never quite get to the apple but who needs the extra calories, and that soft carmel laden with pecans just slides off the skin sooo nicely. There may be an “apple” in your future for playing the home game. Thank you for reading! They always remind me of Sumter, SC! No doubt, it’s good eatin’. Thanks for reading, Mom! Love you. I knew I liked you, Amy! I too adore the McRib and the Project!! Brilliant! I just did my signature laugh-snort-giggle! I hadn’t thought to use “McRib” in that way, but it does make delicious sense. Thanks for the laugh and thank you for reading! 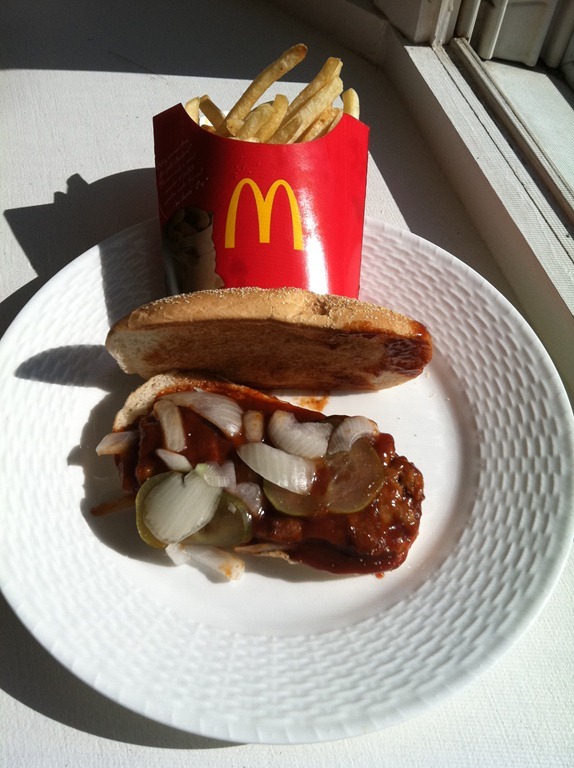 Wow, it’s been years since I’ve had a McRib! There was a great story in the Wall Street Journal about a year or so ago about McRibs and how some people – you qualify, Amy – eagerly await their yearly appearance at their local McDonalds. For those willing to do roadtrips in their quest for McRibs, someone even put up a website where people around the US can log recent McRib sightings on a map: McRib Locator. Evidently some McDonalds serve McRibs more frequently, so the McRib Locator keeps everyone up-to-date on where they can be found. A McRib Locator? Now that’s something I don’t need to know about … a girl never knows when the urge will strike! Thank you so much for reading and sharing! Glad to keep you entertained. I know a couple of people that are obsessed with the McRib! I’ve never had one, but I’m not a huge fan of BBQ sauce so I bet I wouldn’t like it. I definitely don’t need another guilty pleasure!